MASACHIST, the project featuring Thrufel (AZARATH, YATTERING), Daray (drums; DIMMU BORGIR, VADER, VESANIA, NEOLITHIC) and vocalist Pig (Wojciech Wasowicz, a.k.a. 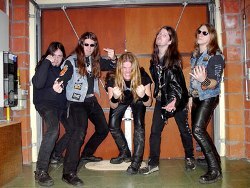 Sauron, DECAPITATED), has posted the songs "Crush Them", "Inborn Obedience" and "Womb" on the group's MySpace page. MASACHIST recently completed work on its debut album at Progresja Studio. The CD's cover art was created by Eliran Kantor, who has previously worked with TESTAMENT. MASACHIST is currently seeking a suitable label to release the album. Germany's Iron Kodex Records has revealed the artwork (see below) for the upcoming debut EP, "The Cult Of Disease", by Chilean doom metal hopefuls PROCESSION. Due in early December, the CD will feature three brand-new tracks plus the songs from the sold-out "Burn" demo tape. UK death metallers NAILED have set a November 3 release date for their second album Hatred, Failure & The Extinction of Mankind. The album is their debut for Anticulture Records and sees worldwide distribution through Plastic Head. Polish portal Interia.pl reports that drummer Dariusz "Daray" Brzozowski and guitarist Maurycy "Mauser" Stefanowicz have left the veteran Polish death metal band VADER. According to the Meinl Cymbals web site, Daray will join the Norwegian black metal group DIMMU BORGIR while Mauser will reportedly concentrate on his UNSUN project, which will release its debut album, "The End Of Life", on September 22 via Century Media Records. Their rumored replacements in VADER are former LOST SOUL drummer Adam Sierzega and either Jacek Hiro from SCEPTIC or Waclaw "Vogg" Kieltyka from DECAPITATED on guitar. This is a myspace bulletin put out by Luke of Sleep Terror over the weekend. Been long enough, huh? This is just a taste of what the next record will be stuffed with. I'm really stoked to get into the studio and see how these songs will come out in The End, its going to sound monstrous. Thanks for all of your patience thus far. Also, looks like I very well may have shirts for the Europe All Shall Perish tour I'm filling in on from Sept. 11th to Oct. 3rd and should have more when I come back. I'll keep yous posted. Still on the hunt for some cooler designs. It's only one new track, but this is good news for Sleep Terror fans, as it is an indication that more is on the way. Unfortunately, the track is not downloadable from the page, so you just have to keep flicking back to the track. MISERY INDEX have debuted the first new track, 'Occupation,' from their forthcoming album Traitors. The song can be heard now via the band’s official MySpace page. Traitors is set for a September 30th North American release date, October 6th internationally and is available for pre-order now. AURA NOIR is about to return with undoubtedly their finest offering yet, with new album "Hades Rise." The follow-up to 2004's hit "The Merciless" is due for release on August 25th and features guest appearances by Danny Coralles (ABSCESS/AUTOPSY) and former guitarist Blasphemer. Belgian black/thrash maniacs DEMONIZER will release their third album called "Triumphator" on Folter Records in August 2008. The material was recorded at Shumcot studio and mixed and mastered at NecroMorbus studio by NecroMorbus in October 2007. "Triumphator" also featured guest vocals by Noctiz (PARAGON IMPURE, LUGUBRUM) and Nornagest (ENTHRONED). 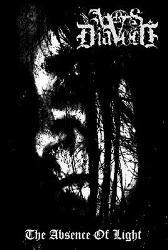 "BLOODPATH", the new video from Stockholm death metallers GRAVE, can be viewed below(see link). 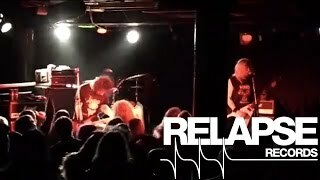 The song comes off the group's latest CD "Dominion VIII", which was recorded by Ola Lindgren in Studio Soulless/Stockholm and mixed by Peter Othberg in Sandkvie Studio/Visby. Vocalist John Tardy of the legendary Florida death metal band OBITUARY has issued the following update: "September 16, 2008 is the official release date for our new 'Left To Die' EP. I think you guys are gonna really like this. It is a completely sick EP. It is really good timing too, the first show of our 2008 U.S. tour is September 16 in Atlanta, GA!!! Looking forward to it! "We have been working on some new songs for our new CD that will be out next year and going over our set for the third and final run through Europe next week. The first show is in Lithuania and then we will be in Holland, Finland, Germany and Denmark! Hope to see you all out there." 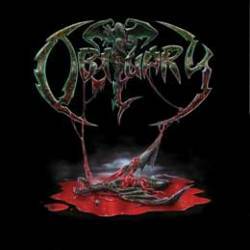 OBITUARY's "Left to Die" EP (see cover artwork below) will contain four songs: two new originals, a new 2008 studio recording of 'Slowly We Rot', and a cover of 'Dethroned Emperor' by CELTIC FROST. Portuguese black metallers ARS DIAVOLI will release their debut album, "Pro Nihilo Esse", on August 29 via Debemur Morti Productions. According to a press release, "The six protracted utterances of self-loathing, wretched surrender and pitiful despair presented on 'Pro Nihilo Esse' reveal your fate: that death is the ultimate answer."